Well I am unintentionally reviewing two books about the going-ons in the White House back to back. Inside the Residence, which did share some secret insights to the inner workings of the men who run our nation, has nothing on the information Alexander Butterfield shares from his three years in the Nixon inner circle. 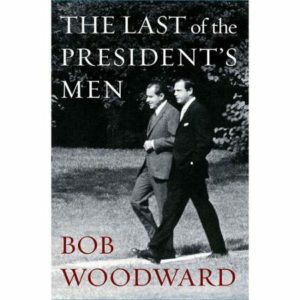 The Last of the President’s Men is Butterfield’s side of the well known Nixon story; it is handled with care by Nixon aficionado Bob Woodward. My biggest complaint would be the jump between past and present tense throughout the retelling of Butterfield’s time with Nixon. Often within the same anecdote. I listened to the audiobook so I don’t know if I missed some punctuationational indication of the tense change but sometimes Butterfield was talking like his Nixon years were in the past and sometimes he was talking like he was actively in the moment. You get a quick summary of Butterfield’s life prior to his time with Nixon. He was enjoying a career in the air force but feared a position in Australia, during the height of the Vietnam War, would halt his plans for further promotions. When he heard an old college friend, Bob Haldeman, was going to be Nixon’s Chief of Staff Butterfield reached out for the chance at a job in Washington. Butterfield accepted a position as Haldeman’s deputy; he became one of Nixon’s right hand men and the rest is history. Nixon was messed up y’all. First of all, the first two months of Butterfield’s time in the White House he had to hide behind things when Nixon entered the room because he was wary of new people and Haldeman hadn’t found a good time to introduce the two. Also, one of Butterfield’s job assignments was to be the go between for Nixon and his wife, Pat, because they never conversed. Butterfield goes as far as to say Pat was a borderline abused wife, although Nixon never physically hurt her, because he would ignore Pat in front of other people. I knew he was paranoid but it went beyond your standard “look behind your shoulder at every turn” paranoia and became a crippling affliction. Obviously, Nixon’s most famous paranoid action was having a secret taping system installed in the White House. Butterfield began to realize his role in the Nixon White House was getting to his personal belief system when he didn’t bat an eye at putting a spy in Ted Kennedy’s secret service detail. After Nixon’s reelection he requested all staff members give their resignation although they could request a new assignment (or to stay in the same assignment) but he wanted to start from scratch if he so chose. Butterfield opted to use the opportunity to have a job outside of the White House and he was named the Director of the FAA. It was after he left the White House that the investigation into the role the White House played in the Watergate cover up began. Butterfield was staying above the fray until his name was brought up by Woodward & Berstein as someone who may know something; Butterfield maintains he had no knowledge of the cover up but that he did know how the White House operated. Eventually Butterfield was brought in before the Senate select committee; he did not plan to divulge the secret taping system but vowed to himself that if asked directly about a taping system he would be honest. As history knows, Butterfield was asked the million dollar question and the tapes became public knowledge; with the tapes in the public’s hands and the infamous gap in the recordings Nixon eventually resigned the presidency. I appreciated the narrow view Woodward took, sticking primarily to the three years Butterfield was in the inner circle and the two years that followed. It was an immensely interesting read. Share the post "The Man that Brought Down a Presidency"